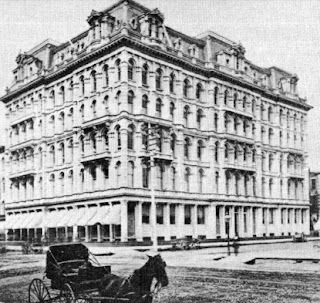 November 14, 1877 – For the third time in its history the great department store of Levi Leiter and Marshall Field burns to the ground. The Chicago Daily Tribune reports on the following day, “The destruction of such an amount of property could not but be regarded as a dire calamity at such a time as this, and so, as the news flew round, people left their firesides, their theatres, their billiard-tables, and everything, to crowd to the scene of action.” [Chicago Daily Tribune, November 15, 1877] In a pouring rain with every fire engine in the city at work, “It seemed as if the entire city had come down-town to witness the terrible scene.” The first alarm is turned in at 8:04 p.m. after someone sees fire in the fifth story of the building at the corner of State and Washington Streets. Flames are found in a four-foot space at the top of the building that surrounds the central skylight between the north and south elevator shafts. It does not take long for the fire to spread to the grease on the elevator wheels and pulleys and from there into the elevator shafts themselves, moving downward, floor by floor. Sixteen minutes after the alarm is turned in, a 2-11 alarm is sounded, but the streams of water from the fire hoses cannot reach the top floor of the building. Fire fighters are forced to run hoses directly into the interior of the great store, which at its center has an atrium, 40 feet by 90 feet, that extends all the way to the roof. Hoses are dragged up to the third and fourth floors and from those points of attack “the brave firemen played upon the heat and fury of the fire until either stricken down by falling plaster and rafters, suffocated by the smoke, or driven from their positions by the heat.” It isn’t until 3:00 a.m. that the fire is finally brought under control, and two fire fighters die in the effort to extinguish the blaze. By November 18 men are put to work, bracing the fourth floor which looked “as though it might come down at any time like a huge avalanche, and bury in its downward flight any who might be so unfortunate as to be within reach of even its shadow.” The insurance companies enlist over 200 men in salvage work, and on the sidewalks of State and Washington Streets there began a massive “fortification, made of cords upon cords of cottons, flannels, silks, white goods, mattresses, dress goods, parasols, kid gloves and umbrellas.” In places the pile reaches six feet high and over 15 feet wide. 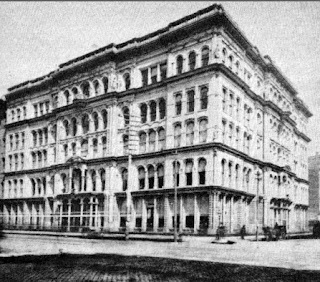 The huge mass of goods is carted two blocks to the northern part of the Exposition building on Michigan Avenue, where insurance adjusters estimate that from $175,000 to $200,000 worth of goods might be saved. 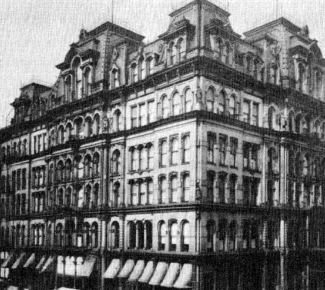 Two years later Field and Leiter open their fourth store in the same location, and in 1881 Marshall Field buys out Levi Leiter and renames the firm Marshall Field and Company. The top photo shows the 1868 store that burned in the Great Fire of 1871. The middle photo shows the store that burned in 1877. The last photo shows the store that opened in 1879. 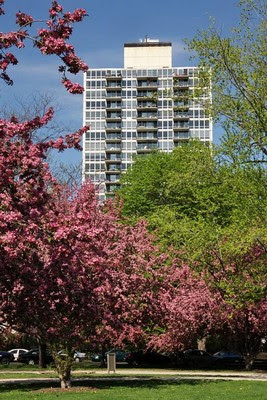 November 14, 1964 – The Chicago Tribune reports that the city’s first “skyscraper condominium,” [Chicago Tribune, November 14, 1964] at 339 Barry Avenue is nearly 50 percent sold out. Jack Hoffman, the president of F & S Construction Company, the developer of the property, says, “Thirty condo homes of the 67 in the building have been sold to date, with families moving in at the rate of two a week.” The $2.5 million reinforced concrete building’s 26 stories overlook Lincoln Park and Lake Michigan and features units from less than $25,000 for a one-bedroom, one-bath apartment on the third floor to $58,000 for a four-bedroom three-bath unit on the twenty-fifth floor. Hoffman says, “We find that about half of the owners are fairly young families who previously rented but who now want to build an equity through ownership while the other half are former home owners who want ownership without the bother of keeping up a house.” That twenty-fifth floor today? A three-bedroom unit on the floor sold on April 13, 2017 for $715,000. November 14, 1978 – Architect Harry Weese introduces his $90 million plan for Wolf Point Landings, a development that will fill “a strategic gap in the development of the city.” [Chicago Tribune, November 15, 1978] The center of the project will be the renovation of the North American Cold Storage Building with the addition of two new residential structures on a six-acre site just to the north with amenities that include a 40-boat marina, a riverside boardwalk, and a public park. The plans call for 776 owner-owned residential units in the three buildings with a total of 1,771,000 square feet of living space. Projected prices for units in the renovated cold storage building are expected to run from $55,000 to $110,000 with a completion date of 1980. Completion of the two towers, Kinzie Terrace and Wolf Tower, is expected sometime during 1981. 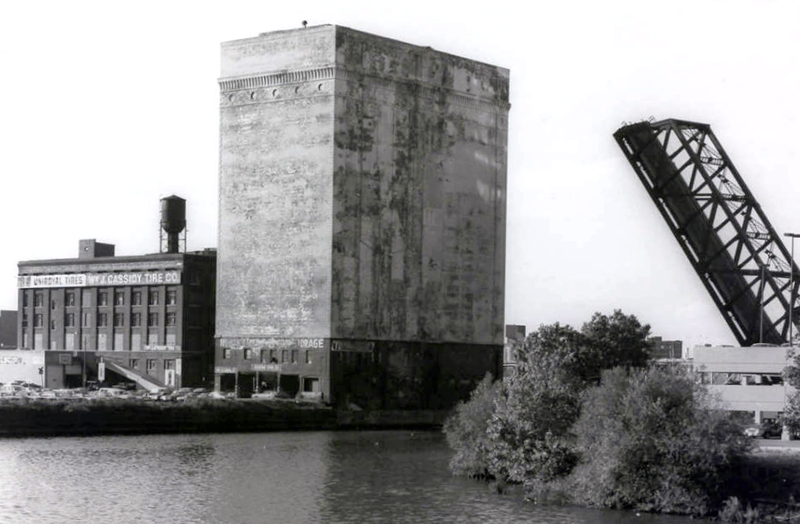 Weese says of the project, “Wolf Point Landings is designed to fill a void, a place where you can walk to work and enjoy the environment.” Fulton House, as it is known today, is shown in the above photo as it looked in 1976 when it was the North American Cold Storage Warehouse.